The idea for this recipe came from two separate places. First, the idea for the chicken came from Grandma Lynda’s YouTube Channel. The idea for the mashed potatoes came from the cookbook which came with the electric pressure cooker that I received for Christmas. 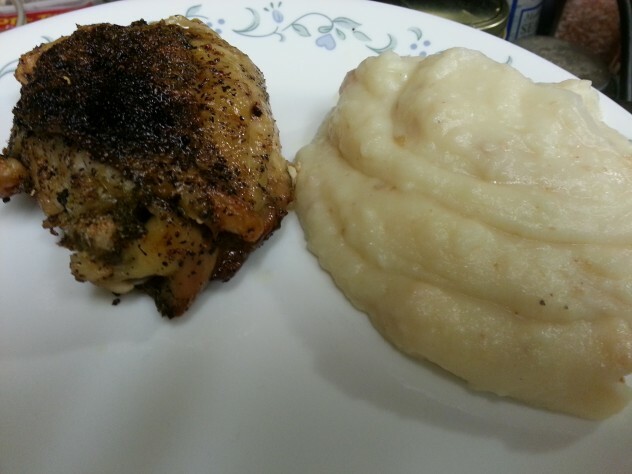 I wanted to make “fried” chicken and mashed potatoes, so I decided to see if I could make both dishes in the pressure cooker at the same time. I began by peeling several potatoes and cutting them into quarters. These were arranged in the bottom of my pressure cooker. To these, I added 1/2 stick of butter, 1 cup of milk, and 1/2 cup of water. Once these ingredients were in the bottom of the pressure cooker, I inserted the steam rack and arranged the chicken pieces which had been liberally sprinkled with salt and pepper on top of the rack. The timer was set on the pressure cooker for 15 minutes. After the pressure cooker completed cooking, the pressure was released and the lid removed. 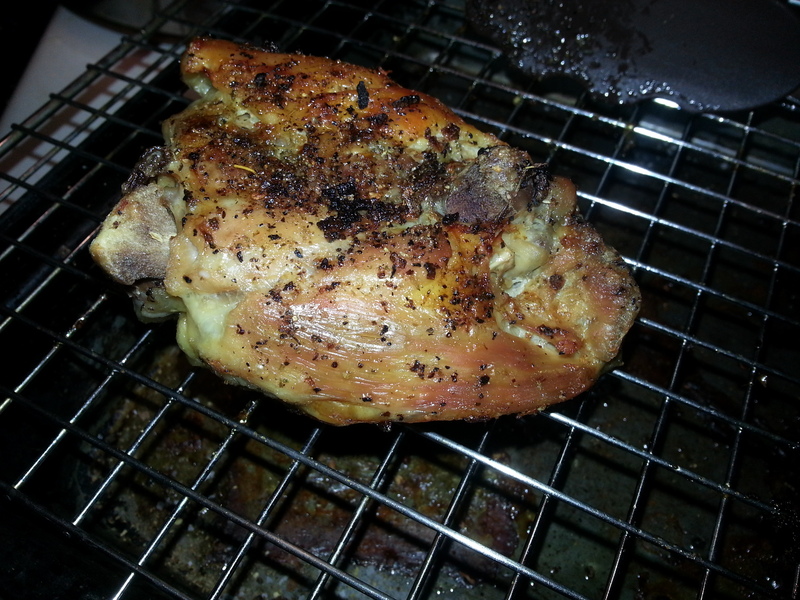 The chicken was removed from the pressure cooker after cooking and was arranged on a rack over a pan. 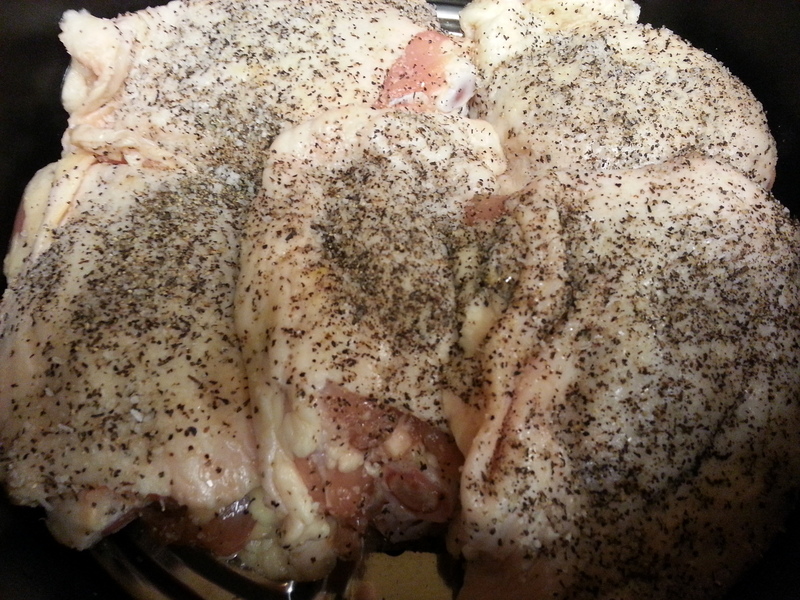 The chicken was then sprinkled liberally with organic, no salt seasoning mix. The pan with the chicken was placed in the oven and broiled for 5 minutes on each side or until crisp. Five minutes was plenty of time for the skin to crisp up. While the chicken was in the oven, I used my immersion blender on the potato mixture in the pressure cooker and turned the potatoes into mashed potatoes. If your potatoes are a little too dry, you can add a little bit more milk, but you probably won’t need to. Baker’s Man and I both thought that these were the best mashed potatoes we had ever eaten. The flavor added to the potatoes from the meat dripping down onto them while they cooked made them very flavorful. The chicken was crispy and delicious, and I didn’t miss the breading on the skin. I know it looks burned in the picture, but it’s just my lousy photography skills. It’s the same piece in the photo above. It was perfect and delicious. I strongly recommend this nearly one pot meal. It cooks quickly and gets dinner on the table in no time. We will definitely be making this again. I have a 6 quart electric pressure cooker. Please consult the manual for your pressure cooker before attempting to cook this dish. Different pressure cookers may have different requirements for cooking. Here’s your printable recipe. Give it a try and let us know what you think. This is an almost one dish meal. The chicken and potatoes are cooked together in the pressure cooker. While the chicken is browning under the broiler, the potatoes are mashed and dinner is on the table in record time. Note: I have a 6 quart electric pressure cooker which I used to prepare this meal. Please consult the owner's manual for your pressure cooker before attempting this. Your favorite chicken seasoning blend. Arrange potatoes in the bottom of your electric pressure cooker. 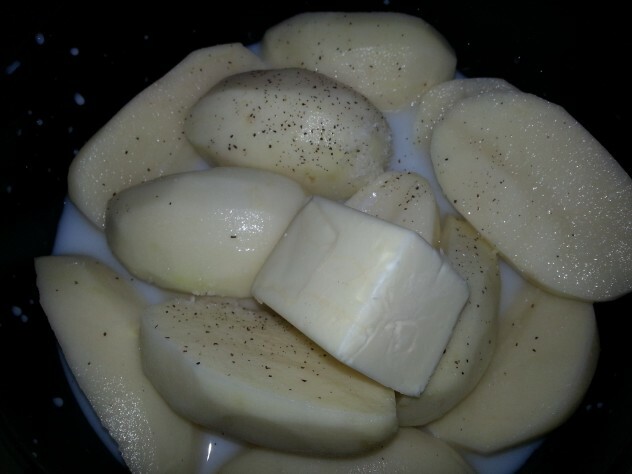 Add butter, milk, water, and salt and pepper to the pressure cooker with the potatoes. Add the steaming rack to the pressure cooker. Salt and pepper the chicken pieces and arrange them on the rack in the cooker. 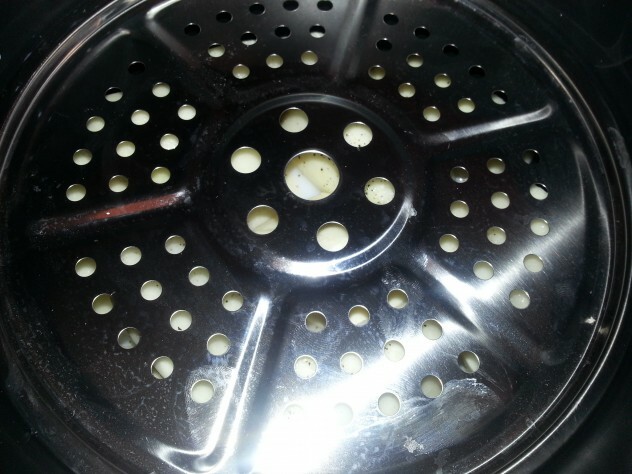 Place the lid on the pressure cooker and turn it on to cook for 10 minutes. Once the cooker has finished cooking, release the pressure according to the manufacturers instructions, and carefully remove the lid. Arrange chicken pieces on a rack over a baking pan. Sprinkle liberally with your favorite spice blend. I used an organic no salt seasoning mix. Broil the chicken pieces for 5-10 minutes on each side or until golden brown with crispy skin. This took only 5 minutes for me, but my friend needed 10 minutes. While the chicken is in the broiler, use an immersion blender, or a nylon potato masher to mash the potatoes . Nutrition information is for a serving comprise of one leg, one thigh, and one-fourth of the mashed potatoes. It’s a LOT of food. As I mentioned in a previous post, I didn’t know I wanted or needed an electric pressure cooker, but I have fallen in love with my electric pressure cooker. It has been fun discovering how to use it. Brilliant. Super easy, fast and tasty. Made smaller amounts in my 3 liter stove top pressure cooker. The original idea for this post was inspired by a recipe, which I saw on Grandma Lynda’s YouTube channel. Her recipe was done in a stove top pressure cooker. You should really check out her channel. I’m glad that you liked my version of her recipe. Thanks for commenting.